Is your place in need of a style update? Apartment Guide has partnered with TV host and design expert Kim Myles, as well as style bloggers, for the second annual Apartment Guide “Your Picks. Your Place.” Sweepstakes. 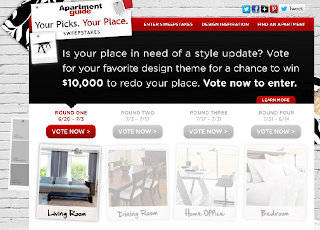 From now until August 14, visit YourPicksYourPlace.com to vote once per day for your preferred room design showcasing furniture and home décor items selected by featured bloggers. The site will feature four different room designs every two weeks. Here's the deal. 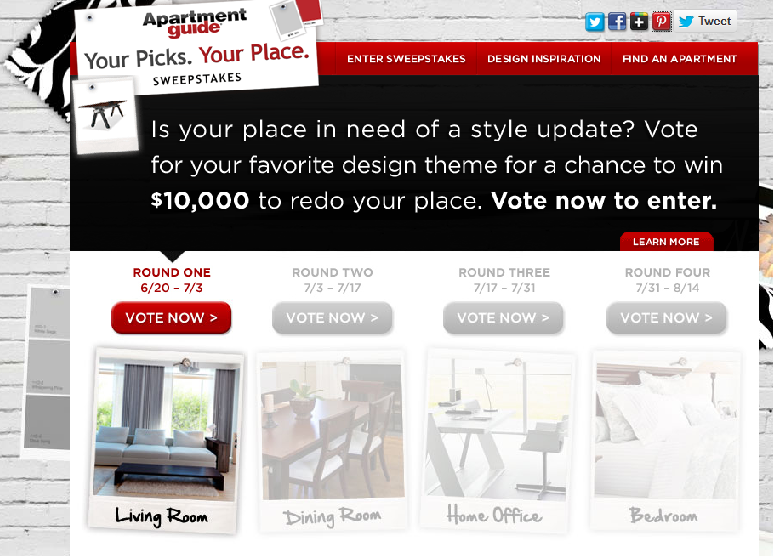 When you visit the site and vote, you’ll be entered for a chance to win a $10,000 grand prize or one of eight $250 weekly prizes to go towards your own selections for your home. While you’re on the site, check out the design and décor tips from Kim Myles, Apartment Guide and featured bloggers to help you design a room that’s uniquely you. This is definitely a big help for renters out there money wise as well as when it comes to design. I think it's a great project!